All things Yen and mummy!!! : Spiderman Party!!! On Sunday Yen went to her friends 4th birthday party. 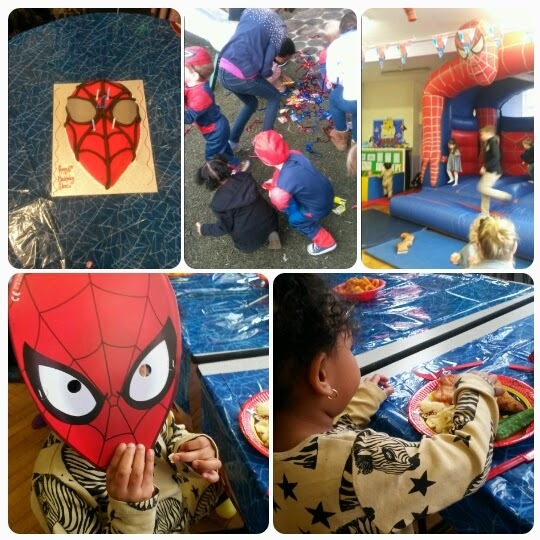 I must say it was really good, there was a clown, Spider man, nice food, piñata, ball pool and a bouncy castle. When the entertainment came Yen freaked out with the clown so she wanted to play outside on her own. I hope when she gets older she will be fine with clowns. This was her 2nd party she has been to from children at her nursery. Yen had a great time she saw few of her friends she was really happy and I love that. Me on the other hand I went out Saturday night with my girls had a good time. I got home about 6:00am had 2 hours sleep then went into mummy mode. I gave yen breakfast, played tea parties then got her ready for her party. I was soooooo exhausted but Yen was really excited about the party so I had to take her. After the party I dropped Yen off go her Nans then I went to get my tattoo done.